It’s only now that 10-month-old Poorvi recognizes her parents. She has been so disoriented in the past two weeks that even her mother’s voice that once made her light up with joy, went ignored. Poorvi has been living with the trauma and pain of gangrene ever since she fell critically ill on May 28th. What started as a fever, soon turned into violent vomiting. Her little body lay weak and fragile in her father’s arms as he carried her to the hospital. 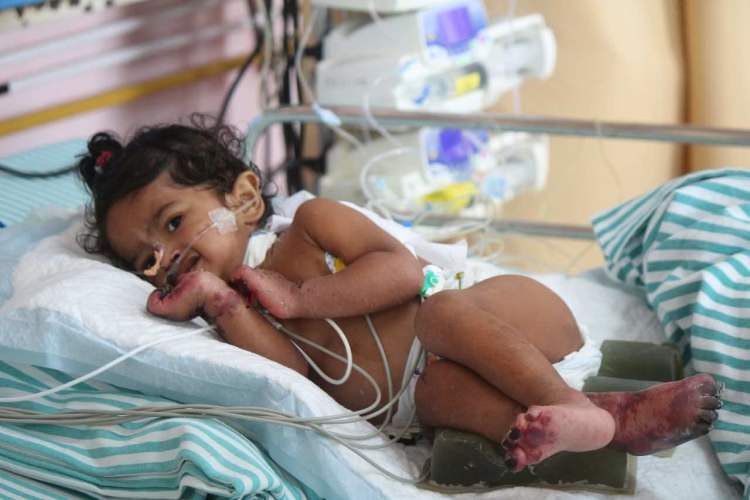 In no time, her hands and feet started turned black and she was rushed to the PICU. Nagaraj and Sangeetha stood horrified as they realized that their baby was slipping away from them. 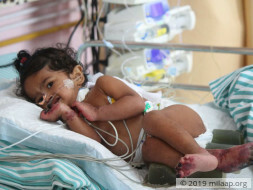 Baby Poorvi has symmetrical peripheral gangrene, dead tissue caused by lack of blood flow affecting fingers, toes and limbs. She also had bleeding in her intestine which was causing blood in her urine. She had surgery for the bleed yesterday, but she’s still not out of danger – gangrene still threatens her life. 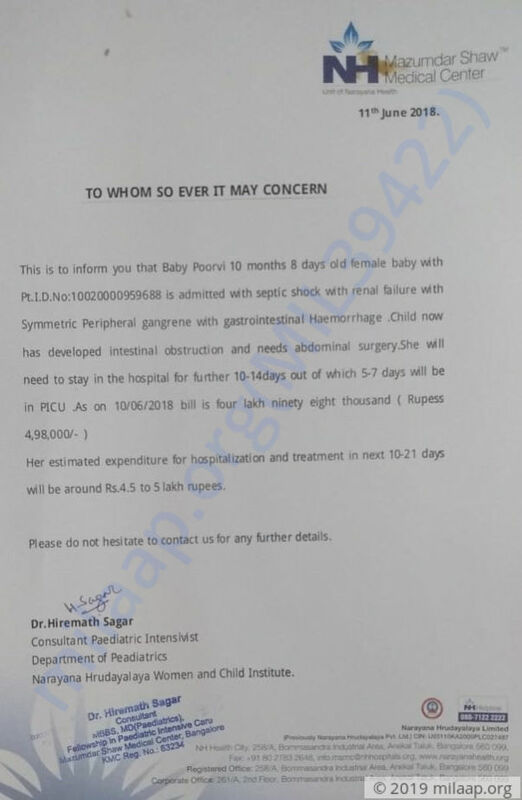 The only thing that can save Nagaraj and Sangeetha’s baby girl now is continued stay in the PICU. She needs to remain under strict observation for at least 7 more days before she can start recovering. Nagaraj works as a contractor and has already borrowed 4 lakhs for his baby’s treatment till now. He has no other way to save her and needs your help. Baby Poorvi is at home and recovering well. We have started Ayurvedic treatment for her too. However, she still needs support to make movements. She has a normal diet and she remains on bed-rest mostly. It's still a long road ahead of us. We are glad to let you know that Poorvi has been discharged from the hospital. There has been tremendous improvement in her condition. The doctors have reported that gangrene is under control. She needs to come back to the hospital twice every week for injections that would help her complete the treatment. At present the doctors feel that a change from the hospital environment to home would help speedup the recovery. We thank you are your you support and prayers. 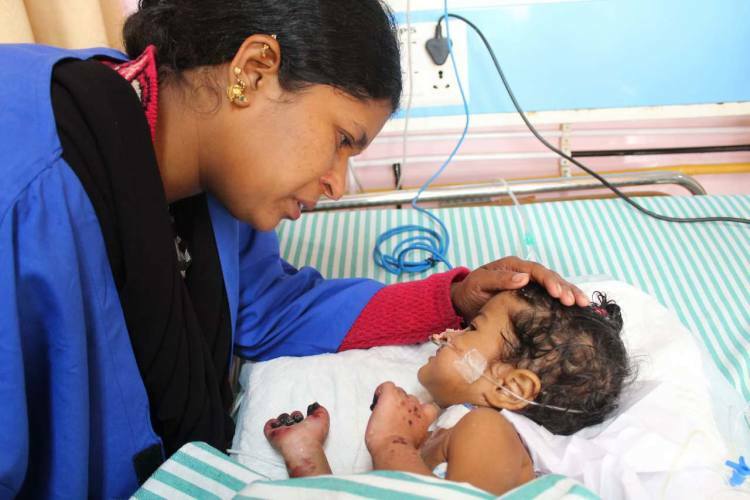 Baby Poorvi was put off ventilator support but she's till in PICU and recovering. She's conscious and can make movements, she now recognizes her parents. Doctors have suggested that they will observe her for few more days as she still has some swelling in her legs. She also underwent a surgery last week which was successful. As of now, she's being fed with the help of tube but there have been some improvements in her health.